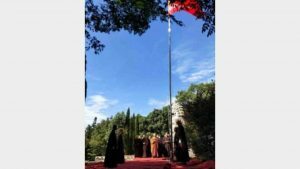 In its 2018 annual report, US-based non-governmental Christian nonprofit China Aid points out that last year, the most significant change in China’s church-state relations was that “politics takes priority [and] subordinates religion.” Making people sing the national anthem, raising the national flag, and hanging portraits of Mao Zedong and Xi Jinping in churches, as well as incorporating the State Administration for Religious Affairs into the United Front Work Department – these are all signs that the Chinese Communist Party (CCP) is taking full control over religion. On November 26, 2018, in Shaji township of Yucheng county, under the jurisdiction of Shangqiu city in central China’s Henan Province, a Mao Zedong statue was placed at the entrance of Mulan Temple (formerly “Jade Emperor Temple”). 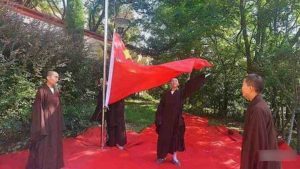 According to a source, the township government demanded to put up the statue of the CCP leader. 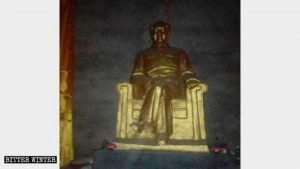 Mao Zedong statue enshrined at Xiaozhaolou Temple in Huangzhong township. Similarly, Sansheng Temple (literally, Temple of Three Saints) and the Temple of Lord Guan, (both in Huangzhong township of Yucheng county) were threatened with demolition if they did not erect a statue of Mao Zedong. Video 1: A Mao Zedong statue is standing next to a statue of Guan Yu, a famous general in ancient China, displayed at the Temple of Lord Guan in Huangzhong township. “Now, the government is conferring the title of ‘gods’ on [China’s] leaders!” one temple’s director said with a sense of helplessness. Tearing down a portrait of Xi Jinping without permission can also be deemed a crime. On December 24, government personnel from Huangzhuang, in Henan’s Jiaozuo city, arrived at a local Three-Self church meeting venue and ordered it to be shut down because the portrait of Xi Jinping had been torn down without authorization. 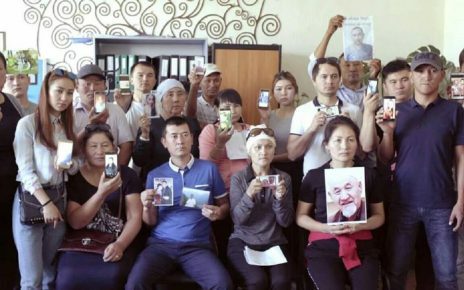 However, the church’s members have video footage proving that the portrait was, in fact, secretly torn down by government personnel to lay the blame on the church so that it would be shut down. The officials threatened the believers not to publish the video and insisted the meeting venue be banned. “During the Cultural Revolution, if you were even slightly disrespectful towards a portrait of Mao Zedong or the Little Red Book [“Quotations from Chairman Mao Zedong”], it would be treated as a punishable offense. Now, Xi Jinping is doing the same thing,” an elderly resident lamented. 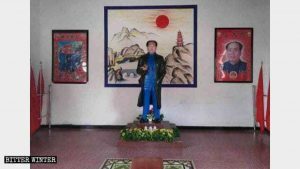 A statue of Mao Zedong and portraits of CCP’s four “great men” at Wanshou Palace in Jiujiang city. Such incidents are not unique to Henan. 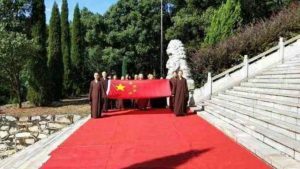 At Wanshou Palace, Tianbao Temple, and other temples in Jiujiang city of southeast China’s Jiangxi Province, bronze statues of Mao Zedong and other “great men” have been placed in conspicuous locations. 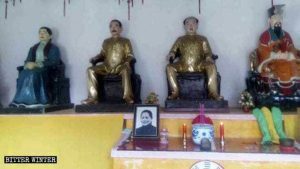 Statues of Mao Zedong, Sun Yat-sen, the first provisional president of the Republic of China, and his wife, Soong Ching-ling, are placed inside the Tianbao Temple in Jiujiang city. Monks at some temples have complained that they must also frequently study the new Regulations on Religious Affairs and take periodic exams. Every day, they are kept busy until one or two o’clock in the morning. Video 2: Portraits and statues of “great men” enter China’s temples. 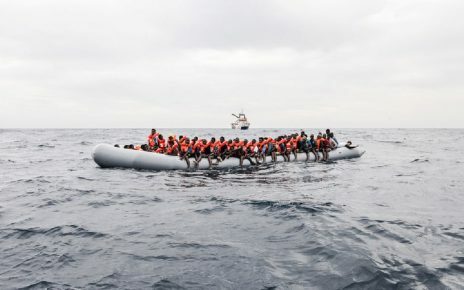 Bob Fu, the founder and president of China Aid, said that certain components of China’s current policies on religion are starting to look like those of 1930s’ Germany, when, under the leadership of the Nazis, photos of Hitler were displayed behind pulpits along with symbols of the regime. 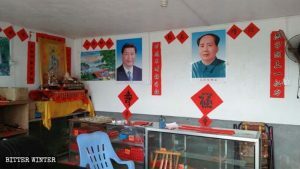 Portraits of Mao Zedong and Xi Jinping at Qingfeng Temple in Hengxi village of Qingliu county in Fujian.